“Related to this is a bill that deals with fee-setting authority, as covered by CCIA three days ago.”So they basically decided that proprietary Microsoft formats are the gold standard? This is ridiculous. What about ODF (Open Document Format) or XML-based formats that do not contain blobs and Microsoft-specific directives like OOXML? Today, the House Judiciary Committee is scheduled to markup Rep. Chabot’s newly-introduced SUCCESS Act, which is itself a combination of portions of two other bills Patent Progress has covered: Reps. Comstock and Adams’ SUCCESS Act, and the fee-setting authority contained within Rep. Chabot’s BIG DATA for IP bill. Each bill is individually worthwhile. The SUCCESS Act attempts to address the relatively low number of patent applications filed by underrepresented groups. And fee-setting authority is important to help prevent marginal patents from being issued. At the same time, Rep. Chabot’s bill does not currently incorporate any of the suggested improvements to the SUCCESS Act designed to study the impacts of patents that never should have been granted when they’re used to threaten innovative companies founded by underrepresented minorities. Without these improvements, the SUCCESS Act can only study a portion of the barriers to innovation faced by underrepresented minorities. The problem with many of these bills is that they’re promoted by bribed politicians. They try to shape the law depending on which millionaires and billionaires sponsor them. SCOTUS decided on Alice and patent maximalists like Watchtroll and Patently-O try hard to get US Congress to intervene, counterbalanced by the likes of HTIA, CCIA, EFF etc. Injunctions are basically something like an embargo, imposed by the ITC typically. We have already seen how the ITC simply disregards judgments made by the Patent Trial and Appeal Board (PTAB) on inter partes reviews (IPRs), before or after the Federal Circuit gets involved. This means thar they disregard and totally disreprect the principle of due process — something which certainly makes the U.S. Patent and Trademark Office (USPTO) seem rather aloof or detached from the rule of law. THE previous post spoke about how the Federal Circuit rejects software patents, as does the Patent Trial and Appeal Board (PTAB). An inter partes review (IPR) is almost guaranteed to thwart any software patent if it is applied to one (not a cheap process, but a lot more affordable than a court battle, which can only be initiated by patent holders). “Iancu was a pick of the notoriously corrupt Trump, whose firm had previously worked for Trump. Coincidence?”It is no secret that Director Iancu wrote articles in support of software patents and software patents are not valid anymore, based on what the SCOTUS has decided. This means that the person whom Trump put in charge of the patent office in inherently is disagreement with patent courts. An untenable situation? Iancu was a pick of the notoriously corrupt Trump, whose firm had previously worked for Trump. Coincidence? Either way, everything we have seen so far confirms our worst fears — that Iancu would work for the patent microcosm rather than for science and technology. The patent system was conceived to serve that latter group, not a bunch of lawyers, but things have changed since conception and nowadays the Office is adding yet more fees that make expensive lawyers a must to some. With prohibitive costs, too (maybe $200 per hour). Punishing poor companies, obviously. Upcoming changes at the USPTO do not look promising however. For at least three reasons. Firstly, the patent microcosm is being shielded from competition. “It is no secret to anyone in the industry; the unauthorized practice of law is rampant, and OED does nothing to stop it,” Gene Quinn (Watchtroll) said yesterday. Terms like “unauthorized practice of law” (used both in the body and headline of Watchtroll) imply that it’s illegal to represent oneself too. The patent and litigation ‘industries’ want a monopoly on this activity. A form of corruption surely? Consider Iancu’s professional background and how he might view this. In addition to being a resource for petitioners and patent owners, the Guide has as its purpose “to encourage consistency of procedures among panels of the Board,” akin to the role of the MPEP with examiners. As with the practice of having “expanded panels” to promote consistency in decisions, this function further limits the extent to which APJ’s activities are consistent with an independent adjudicatory arm of the USPTO. That should not take long, should it? So they are making it more expensive yet again (25%) in an effort to suppress IPRs. Battistelli used the same tricks as Iancu. He kept raising the costs of appeals (against bogus patents) in an effort to reduce patent quality and hide all this. Microsoft is a very corrupt company. I should know. I wrote many thousands of articles about it, including nearly 1,000 articles about the OOXML saga (almost as many as the EPO saga that makes the US counterpart look like an angel). I’ve noticed something over the past few years, and I cannot understand if it’s due to erosion of collective memory or due to young people joining in, with little or no understanding of Microsoft’s past (which mostly continues to present, just better veiled or misleadingly marketed). Reddit actually censored a link to this article of ours about Microsoft's ongoing attacks on Free software proponents. It was deleted from the Linux subreddit. Is this like a new thing? Cannot criticise Microsoft even in Linux-centric forums? It had a lot of upvotes and comments. It was on topic and widely appreciated by most. We have been hearing similar things over the past two weeks in relation to other forums, but were unable to verify with strong enough evidence that this was a conscious decision to gag members who had criticised Microsoft. Is the “Microsoft loves Linux” charm offensive targeting enough gullible people to actually be effective? So now they admit this so openly. Having infected so many infrastructures with OOXML lock-in, which typically limits or prevents access by Free software users. Or has developers wasting a lot of time chasing a bogus ‘standard’ that even Microsoft cannot implement or conform to. Gates spoke about breaking compatibility on numerous occasions (that we caught him in antitrust exhibits). The above is just one example among several which we covered here before. Published only hours ago. Where next? Croatia? BACK in the days — nearly a whole decade ago — we used to thoroughly cover Microsoft’s use of corruption to make Microsoft Office an ‘open’ ‘standard’. Given enough money, power, connections etc. one can conceivably achieve anything, especially in poor countries where even dental treatment is a massive treat. Remember that Microsoft offered financial incentives to entire countries (or politicians’ own cities) in an effort to buy their votes. Conversely, sometimes blackmail gets used (“do what we say, or else…”). We covered examples of that. Well, Microsoft still relies on bribes (to officials) to get business 'done'. 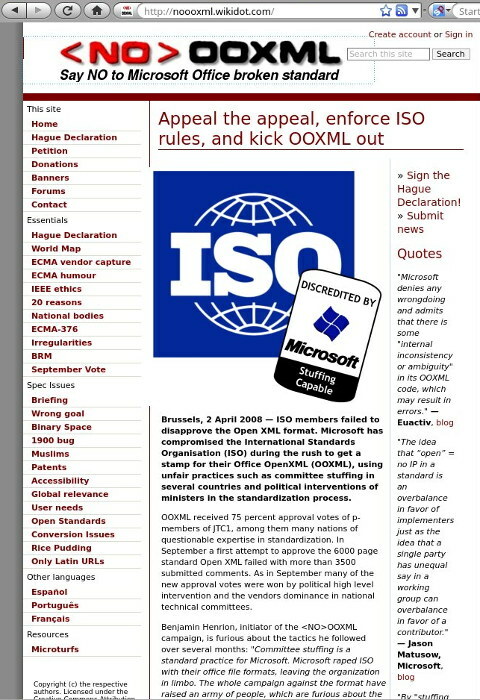 The EPO, which is especially close to Microsoft, is hardly any better. Rather than label itself a private or ‘public’ (in the shareholders sense) corporation it is an international body that acts like a corporation and enjoys exemptions from the law. It even calls itself “European”, even though the only European thing about it is the staff. The EPO is connected to some very powerful people from all over the world and therefore it guards powerful people, obviously at the expense of ordinary Europeans. Battistelli is a good example or a symptom of this, for reasons we covered here many times before. Battistelli often looks more and more (at least appears to outsiders) like he’s carrying out the orders or instructions of somebody else (or many somebodies). The way I personally look at it (yes, personally), Battistelli is the first domino piece to fall and serve as a deterrence against those who follow his footsteps and implement so-called ‘reforms’ that abolish human rights, commonwealth, etc. Next on the list might be Kongstad, e.g. for protecting Battistelli for many years and then hiding his contract. EPO workers need Kongstad to get Battistelli out, but they won’t see it any time soon because Battistelli is Kongstad’s predecessor and the latter now acts more like his guardian (we first pointed this out in 2014). In order to implement popular change (not corporate/billionaires’ change) at the EPO, the Administrative Council too needs to be tackled. They’re mostly lawyers from national patent offices, they’re not scientists or examiners. They too need to be shaken a bit. Then, staff may move on to other culprits (whose power if not reputation as well will be simpler to destroy based purely on their unethical actions, as they’re low-profile people compared to Battistelli and Kongstad). “Well, Microsoft still relies on bribes (to officials) to get business ‘done’.”The EPO scandals will surely outlive Battistelli and Kongstad, so EPO staff should be prepared for a longer struggle before sanity is restored, the EPC is obeyed, human rights are respected and so on. As one reader put it the other day: “It can be a course of events, but I am afraid the domino effect might not be as automatic as we wish. For sure active pressure, e.g. by media and union action, will be needed and still well organized. Laws in and about EPO are murky, so that no matter how unreasonable and indefensible some managers’ behaviour might be, they might still get away with it. “Another key factor would be to get ever more examiners getting out of the dark when showing support and denouncing abuses. This could set the beginning of an end, so to say. Earlier today some people’s hearts sank because they came to realise that the Administrative Council is not on their side. Doctored results and fake union recognition at EPO apparently fooled those who wished to be fooled. This didn’t surprise us at all, but it’s only an expected step, probably to be followed by strikes. I am writing to you as a concerned European and as a software professional based in the UK. As you may know, the management of the EPO is under heavy attack for its mistreatment of staff, which even led to an imminent Office-wide strike and resulted in staff suicides (see TV coverage from earlier this month in Germany). However, I am a lot more concerned at the moment about a parade of misinformation, intended to distract from this and also mislead delegates of your country, who shall soon be attending the Administrative Council meeting in Munich. I want to keep this short, so let me highlight two kinds of lies you may be told by the EPO. The first lie concerns so-called union recognition. There is no such thing at the EPO, except a quasi-staged signing of a Memorandum of Understanding with a tiny union that hardly represents even 1% of staff at the EPO (the real union represents about half of all staff). This is intended to lull delegates into the illusion that relationships between staff and management have improved. It’s far from the truth. In fact, over 91% of staff which voted on a strike last week voted in favour. EPO workers are unwilling to tolerate the abusive management, in spite of their salary and despite the risk of voting in favour of a strike (the ballot provides no real privacy). The second point I must stress is that when the EPO claims improved performance, efficiency, results etc. these claims must be regarded as dubious/questionable at best. Numerous people, professionals in the field in fact, have already demonstrated that the EPO uses misleading statistics in order to give an illusion of success. This, in their minds, is intended to distract from (or justify) the aforementioned abuses and consequent unrest. Over the past few months I’ve covered examples where the EPO lies not only to staff but also to journalists. In a desperate effort to salvage their reputation they are now creating an alternate reality. Sceptical analysis of EPO claims thus becomes a survival skill. I want to see the EPO repaired. I wish to see it serving the European people and European interests. Right now the EPO is merely being used by very few people to advance their personal interests and this is unsustainable. It will, over the long run, damage Europe’s science, technology, and reputation. “Amid abuses that are widely recognised both at the EPO and outside of it the ‘opposition’ sounds like not even a slap on the wrist (hardly even that).”It’s hardly a strong statement. Amid abuses that are widely recognised both at the EPO and outside of it the ‘opposition’ sounds like not even a slap on the wrist (hardly even that). I see Mr. Battistelli has signed an agreement to subsidize searches carried out for Lithuanians as for “Cyprus and other member states”. Only a cynic would suggest that this is a mechanism to encourage these states to support him in the AC. Some believed that Battistelli had "bribed" lower management for support (like Microsoft did for OOXML at ISO) and now again some interpret that as a bribe. This is not sufficient evidence, but still, it cannot count for nothing at all. There is at the very least a perception that Battistelli gave some gifts and got one back. Remember Battistelli’s money-waving strategy when dealing with Dutch politicians. It hardly works in rich countries. The controversial punitive measures for employees of the European Patent Office, with among others an office in Rijswijk, are to be reviewed. With 12 abstentions 26 of the 38 Member States of the office Wednesday in Munich have voted in favour of fair sanctions, sources confirm. The international organization (7,000 employees) accepts patent applications and grants European patents. The position of the President of the Agency, the Frenchman Benoît Battistelli (65) is under pressure because of his “authoritarian” management style. During a critical interview in early March with State Secretary Martijn van Dam (Economic Affairs, Labour Party) which Battistelli left in anger, this newspaper reported Wednesday. The council, which met Wednesday and Thursday in Munich, would rather an external investigation into the sanctions. In today’s resolution, which today is made public, that demand has been weakened. Battistelli must now consider an investigation or intervention through mediation or arbitration. The management board calls the patent office and the trade union to resume social dialogue and to reach an agreement. The president has embraced the content of the resolution, according to the patent office. As an international organization the patent office claims not to be bound by national labour law. Battistelli does not recognize SUEPO union, which represents half of the total staff, either. 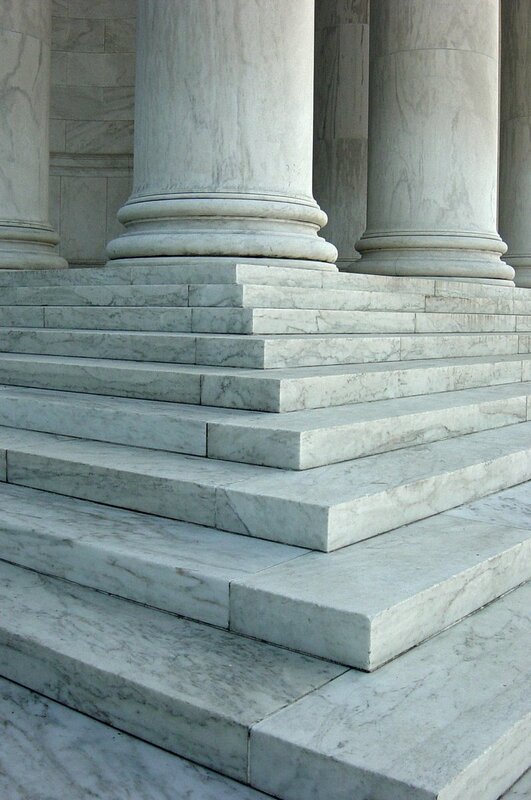 The patent office has its own disciplinary procedures and an internal investigation service to screen workers. The method of this investigation service and the penalty rules are to be revised. It is unclear what will happen to the trade unionists who are punished because of a “corruption campaign.” The Dutch Elizabeth Hardon, chairman of SUEPO in Munich, was fired and her pension was reduced. Her predecessor Ion Brumme was fired and the treasurer of the union, Malika Weaver was cut in her salary. Other members of the union have received official warnings. Notice that the above cites/quotes documents we leaked last night (at around 2 AM). Is the EPO peaceful now? No. “For the second day in a row in Twitter, the EPO lobbied for software patents (using the weasel word “ICT”) and will do the same tomorrow.”There will almost certainly be strikes soon. Is the EPO’s propaganda over? No. MICROSOFT’S attacks on Linux never stopped. Anyone thinking otherwise must not have paid attention. To make matters worse, Microsoft is manipulating the media into pretending that “Microsoft loves Linux” and that there is “peace”. In this post we are going to share some stories of interest to assure readers that nothing has changed except Microsoft’s rhetoric and some of the attacks have become more discreet. If Android (Free software) is an antitrust violation, what does that make proprietary software? Microsoft and its proxies, as we have shown over the years, were behind these complaints. Remember that back in the SCO days, i.e. around 2003-2005, the Microsoft minions (and few others) tried to frame the GPL itself as anti-competitive. They failed, but it took time and cost money. One of the first questions that the FTC must tackle here is, who is behind the complaints? They may find that it’s little more than a Turf War. (Mis)Using Feds as pawns in the battle (a Turf War), as in using the government to derail one’s competition (even Free software), should be a crime. It is a waste of resources. When the media claims that Microsoft and Google now have “peace” (on patents) be sure to reminder the reporters of what Microsoft has done to cause Google (and Android) antitrust trouble. It is very well documented and we wrote over a dozen articles touching on this subject alone. “Tell Mary Jo Foley that this is not a “deal” but an extortion.”As we noted the other day (and many people read this article, some news sites even linked to our analysis), Microsoft under Nadella is no different from Microsoft under Ballmer, at least when it comes to patents. The monopolist, under Nadella specifically, has already attacked Samsung, Kyocera, and Dell (over Linux/Android). Where is the love? Does Microsoft have patent peace with Android now? No, of course not. There is no peace even with Google, there is just a settlement in the Motorola case. Microsoft is leaving Motorola aside and is just attacking the OEMs instead, continuing with this latest assault on ASUS. Microsoft is still blackmailing companies, using patents, into bundling Microsoft spyware with non-standards (lock-in). This is extortion. Tell Mary Jo Foley that this is not a “deal” but an extortion. Tell this to others who believed that we have a ‘peace’ for our time after Google and Microsoft reached one settlement (regarding Motorola). Android is being infiltrated by Microsoft now. It wouldn’t have worked without patent extortion. As Microsoft’s Mouth (Mary Jo Foley) put it: “As nearly two-dozen Android, Chrome OS and Linux vendors are doing, ASUS seemingly is licensing Microsoft’s patents to cover anything that is in those operating systems which potentially infringes on Microsoft’s intellectual property. “Patents are being used for leverage.”So Microsoft is embracing and taking over Android inside ASUS. Remember the ASUS EEE? It used to run GNU/Linux before Microsoft intervened. 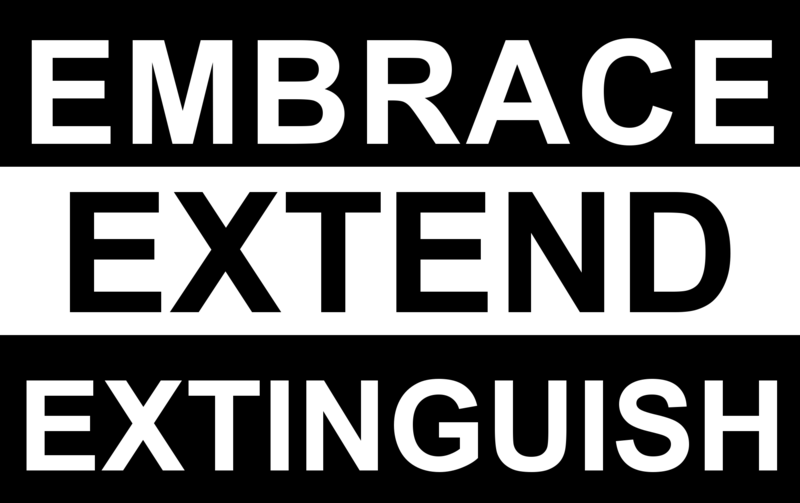 Microsoft calls it EEE, which also stands for “embrace, extend, extinguish” — Microsoft's currently principal strategy against Android. Mark Hachman chose the headline “Microsoft strikes a deal with Asus: We won’t sue if you put Office on your Android devices” (we fought for years against it, starting with the Microsoft/Novell deal). Untimately what we are seeing it is a strategy that first became publicly known after Microsoft had done this to Samsung (earlier this year). Threatening to sue companies if they don’t serve Microsoft’s agenda is not a new strategy even when it comes to GNU/Linux as a whole, Android set aside. See the Microsoft/Novell deal (2006). Patents are being used for leverage. “Rob Enderle, who also worked for ECT and is notoriously close to Microsoft, is simply described by ECT as “Rob Enderle, principal analyst at the Enderle Group.””What a sham. Richard Adhikari basically interviews Microsoft moles regarding Linux when he’s not busy writing his lots of anti-Android articles (usually regarding security). Al Hilwa and Rob Enderle being his “sources” tells us a lot more about him, perhaps his agenda too. Well, to be fair and to give him the benefit of the doubt here, quite often when it comes to so-called ‘analysts’, everywhere you look it’s proprietary software (e.g. Microsoft) and its minions. Even Dana Blankenhorn, who used to cover Open Source for ZDNet (sometimes being an apologist for Microsoft), has just said in the financial press that “Microsoft has stopped fighting with open source” . Well, that is complete and utter nonsense. It didn’t stop, Microsoft still does all sorts of things to both Linux and Android. Other financial press says that Microsoft “has finally succumbed to the free OS Linux” because Microsoft copies Linux code, raising all sorts of GPL-related questions and potential issues [1, 2]. “Alliance for Open Media” is the latest Orwellian name/title for that which casts DRM collusion as “open”. Typical DRM proponents are part of it (Microsoft included) and so is Mozilla, which joined the DRM cartel about a year ago, causing much anger among many of its strongest supporters. DRM is not “open”. It’s not even compatible with the notion of “open” as this strictly requires proprietary software. Mozilla gave up on “openness” when it entered the DRM conspiracy and now we have the press littered by lots of puff pieces that frame DRM as “open” (however they define open, maybe alluding to patents). These are manufactured false perceptions and spin, calling a DRM conspiracy “Next-Gen Video Format” [1, 2, 3]. Here is the press release. It’s hogwash. It is sad to see the Open Web falling over like this, after the MPAA essentially bribed the World Wide Web Consortium, which had hired a fool from Novell (we wrote a lot about this in prior years). These people are trying to set up ‘standards’ with patents on them and DRM as part of the (secret) ‘standard’. When it comes to what they define to be “open”, it’s just about patents. When a bunch of companies agree not to sue each other (like OIN, which has just added WSO2, but proved rather fruitless when one member, Oracle, sued another, Google). “In joining OIN, an organization dedicated to defending the Linux ecosystem, WSO2 extends its commitment to fostering innovation through open source software,” says the summary from the new press release. That’s nothing to do with innovation. It’s nothing to do with FOSS, either. Many members are proprietary software companies just agreeing on patents being pooled together. Many of these patents pertain to sofwtare and are therefore inherently incompatible with FOSS. Therein lies the core of the latest spin, misleadingly named “Alliance for Open Media”. It’s not a standard but a collusion. That’s what it is. It is, at best, a patent pool. Has Microsoft finally, truly warmed up to open source? New CEO Satya Nadella (shown) is definitely pushing that notion. Several media outlets previously reported on his comments on how he “loves Linux” and he has claimed that approximately 30 percent of Microsoft’s Azure cloud is already Linux-based. Any GNU/Linux instance running under Microsoft’s control is already compromised, with back doors included. It’s basically dependent on proprietary software from a company which notoriously colludes with the NSA. DESPITE Microsoft’s gross behaviour and sheer influence in the Indian government, the Government of India recently managed to pass new laws in relation to software, making Free software a necessity (to what degree depends on the article one trusts the most, as there have been at least a dozen of them in English). This makes perfect sense for a software powerhouse like India. It would benefit local industries. India can be self-sufficient in the software sense. Meanwhile, here in the UK the government managed to pass pro-ODF policies, despite lobbying by Microsoft, its proxies, and its British partners. We covered this last year and we played a role in giving feedback to the government, at the expense of many hours and as much as one day’s work. We now have what can be cautiously labelled Free software-friendly procurement policy even in the UK, which has historically been one of the most Microsoft-friendly countries in the world. Microsoft is publishing the source code to certain parts of .NET. The terms of distribution (the licence) is the combination of the MIT licence and a separate patent promise. Given that Microsoft has a history of aggressively using software patents against free software, we decided to take a look at the legal details. If you only intend to use the software as published by Microsoft, then everything looks fine. The patent promise (if it’s even necessary) will apply. If you intend to modify the code, then the protections of the patent promise may be necessary or useful and you should take care. And if you’re looking for a project to contribute to, then it would be worth giving your preference to projects which don’t contain conditions which create or suggest patent risks if the code is used in other free software projects (outside of the set of .NET Runtime projects). Paul Krill, a Microsoft-friendly writer (for many years now), has meanwhile published “Windows goes open source?” (not April’s Fool). Paul Krill consciously (or not) helps Microsoft openwash Windows, pretending there are such legitimate claims as policies in governments change to require “Open Source”. What we have here is a misinformation campaign. You love Open Source? Then you will love Microsoft. That’s the (almost) daily message from your Microsoft-affiliated and at times Microsoft-bribed friends (acting as ‘reporters’). This relates to statements like this one from Linda Humphries, titled “Making document formats open, it makes them better” (the same applies to software, not just data). Francis Maude has just met (i.e. lobbying) with a Microsoft liar, Michel Van der Bel (see her mentioned in this older post). Microsoft pretends that it can deliver ODF support and that therefore the government’s requirement (ODF) and preference (Free software) should be compatible with Windows and Office. To quote the article: “Stanchak said Cabinet Officer minister Francis Maude met with Microsoft’s UK country manager, Michel Van der Bel, to discuss the company’s work on open standards to enable universal document access across government departments. “Maude said the use of ODF will deliver significant savings to the public sector. “”This will give people more choice about the software they use. This supports our digital by default agenda, which is helping save citizens, businesses and taxpayers £1.2bn over this Parliament as part of our long-term economic plan,” he said. Microsoft now pretends otherwise. More lies from Microsoft UK, an opportunist with NSA connections. The British government’s decision on office suites (if they’re needed at all) shouldn’t be about picking a ‘cloud’; it would be a privacy farce. If the government was ever to adopt Microsoft ‘cloud’ (i.e. NSA PRISM with that glorified ‘cloud’ buzzword which appeases non-technical people), would it be sued by any British citizens for supporting espionage by foreign spies? A lot of personal data is being encoded and stored in such documents. In the past, for NSA to acquire data/files from Office it needed to use Microsoft’s Windows back doors. With Office 360 [sic.] it’s becoming trivial. Microsoft is in PRISM.